While a grooming table might not sound like a necessity when it comes to grooming your dog, you will quickly regret that thinking as soon as you try using one. Using a table specifically designed for grooming your dog can not only make the task much easier, but also safer. It’s also obviously a much more economical way of grooming your dog instead of paying a professional groomer, not to mention your dog would also feel much more comfortable with you grooming your furry buddy with love. So without further ado, let us help you narrow down your choices to 9 of the best dog grooming tables. Well, let us tell you right off the bat that there are hundreds of customers reviews for this product explaining why the customers are all praise with it. And that’s for a reason. It offers everything that you would need no matter what your needs are. Are you a beginner to dog grooming and want something that makes the job easier? The grippy rubber surface would attract your dog with the adjustable grooming arm making the task a breeze for you. Are you a professional with a dog grooming business? 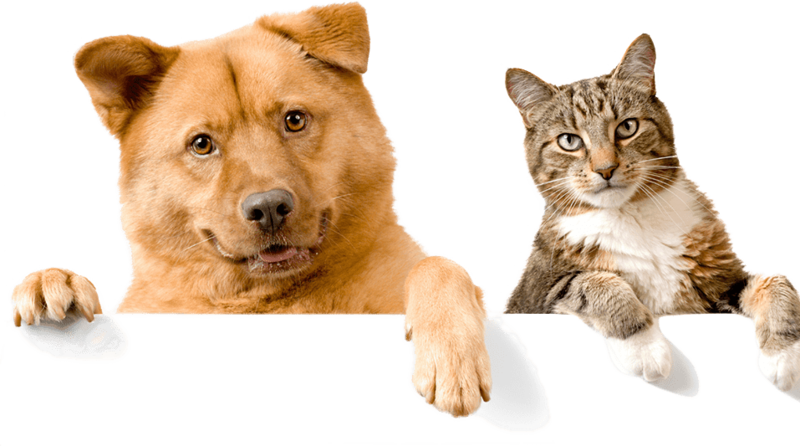 Well, it has everything to help you offer a great grooming service for all types of dogs, the high-maintenance ones included. Do you have a large dog that you don’t find comfortable to groom on the other, smaller tables? It’s generously sized and would be large enough for most large dog breeds as well. It’s made using a high-quality, rust-proof stainless steel, has a mesh storage shelf with great durability and sturdiness, both the arm and loop are adjustable, and the table itself is amazingly lightweight and portable. It offers pretty much everything you would find in a professional grooming table that probably cost thrice as much as this one, and that’s without compromising on the quality one bit. It’s amazingly versatile due to the design and its superior adjustability, making it a perfect choice for pretty much everyone regardless of their needs. If you’re on a budget and aren’t after a professional-grade grooming table like our top pick above, then this product is what you need to go for. It’s well-built, made using rust-proof and high-quality materials, easy to clean, and has a non-slip, static free surface. This paves the way for a very easy grooming experience for new pet owners or those that are new to dog grooming. The trade-off for the huge price difference despite the great quality and functionality is that it’s on the smaller side, not as sturdy, and doesn’t come with a storage shelf. However, other than that, there’s nothing you wouldn’t like about it. While the table’s height is not adjustable, the arm’s height is adjustable to 40” high. The four rubber-capped legs offer great stability, which turns out to be very useful when treating nervous or frightened dogs. Obviously, there’s also a noose to prevent your dog from moving during the grooming session. Further, the noose is also adjustable, meaning you can decide the height at which it hangs from the arm. It offers a lot at a surprisingly cheap price. If you’re not a professional and fine with not having the basket to store things and not being able to adjust the height of the table, this is a perfect grooming table for any dog owner on a budget. If you have a smaller dog, then you will be hard-pressed to find anything better than this product in this price range. Apart from the table size being smaller, it offers everything you would expect from a table costing well over $100 for about half the price. It’s portable and secure with a non- slip surface, and comes with an adjustable grooming arm that’s both sturdy and flexible. Its four rubber-capped legs are also stretched at a fair bit of distance from one another, ensuring a safe, stable grooming environment for your pup. Further, the storage bottom tray is well-designed and functional, and the table is easy to clean after use. While it may not be the best option for large dogs as it’s size may be a bit of an issue for them, but for smaller dogs, it turns out to be a great all-round product with an adjustable arm, durable, non-slip surface, and the strength to hold dogs weighing up to 220 lbs. This is another product specifically designed for small dogs but it’s a much more unique one than the others. For one, its height is just 4.5 inches, and it’s designed to be kept on an object that’s at a height you’re comfortable with when grooming your dog. This means a lot of flexibility right there. The most unique feature it comes with is that it's non-slip, durable surface is rotatable, so you won’t break your back when grooming your pup from different angles. You can just rotate it to reach different areas and have it much easier. The long grooming arm is adjustable, and can also be detached and attached back. 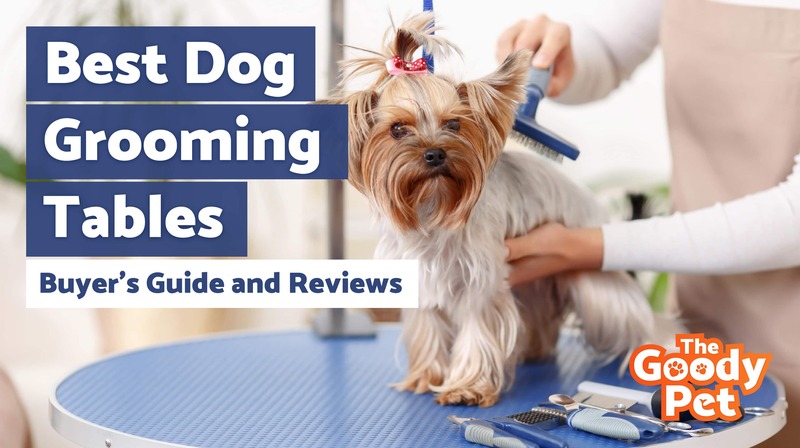 If you have back issues or wouldn’t like to keep moving around when grooming your dog, there are few products that would turn out to be a better choice than this one, especially if you have a small dog. If you have a medium-sized or large dog and would like to have all the features for them but on a budget, then this product would fit your bill pretty well. Just like all the products on our list, it comes with a durable, non-slip surface that’s also static-free, meaning the hair and debris won’t get stuck to it, making it easier for you to clean it. It’s sized more generously than the ones designed for small dogs, and would certainly work well for large dogs as well. It’s on the heavier side but very sturdy, and the anti-slip rubber foot pads do a great job of keeping the table very steady and stable while it’s being used. Further, you also get a storage mesh tray, adjustable arm, and great portability, as it becomes surprisingly small when you fold it. It’s one of the few tables designed for large dogs that come with all the useful features, and at a great price. Measuring 35.8 x 24 x 64 inches, it’s the largest table on our list. This makes it an ideal choice for people with very large dogs like a large cocker spaniel. It also weighs 15 pounds and boasts a solid build quality, so it would also be one of the few tables that would comfortably and safely hold large, heavy dogs. The legs are made of thick metal, which adds to the durability, safety, and stability of the table. The surface is non-slip and comfortable, while the arm is adjustable. It’s easy to set up and fold down, so you would be able to carry it outside your home easily if you want. Finally, it’s probably the cheapest option for really large dogs without compromising on the quality or safety, but the trade-off is that there’s no storage shelf. As we said above, this is the only table you will find in this price range that’s both sturdy enough and designed for really large dogs. Now, this isn’t a complete product with the table, but only an arm with a clamp. However, to the right users, it might turn out to be a better option than going for a grooming table. Unlike most affordable grooming tables, this product comes with a heavy duty grooming arm that’s adjustable all the way up to 36”. Further, the clam is sturdy and well-built as well, with the high-quality steel it’s made of being powder coated for a much better level of durability. Furthermore, it gives you the flexibility to use any table you want, so you have the freedom to decide on the height and size of the table. Finally, it’s also the only product to come with two free (extra) loops, specially designed for a larger and smaller dog. This is one of the few options for those that want to choose their own grooming table, while also getting a much sturdier arm and different loops for small and large dogs, all while being able to save a good bit of money. This table might look very similar to some of the other common dog grooming tables on the market, but it comes with a few improvements over them that really set it apart. The first one is that unlike some of the other products in this price range, it’s both non-slip and waterproof, meaning that it will not only be durable, but also won’t hold on to the water that makes it difficult for you to clean it. Another impressive design improvement is that the corners of this table are well-rounded to avoid any harm to your dog as they move towards the edges. Other common features include an adjustable design, easy to use and set up, and a good build quality. On the downside, there’s no storage shelf, but you shouldn’t expect that with a quality product at this price point. This product is impressively designed compared to some of the other products in this price range, and is quite sturdy, durable overall. We have another product with a more unique design and a bit more to offer than the average dog grooming table out there. The design is unique and very sturdy with strong legs, and it’s the only product on our list with an overhead arm. This allows the product to have three different loops, all with different sizes, making it a great value for money option for people with more than one dog, and of course also for professional groomers. A unique feature is also the grooming tools holder which keeps all your tools handy, making your job easier. Despite the overhead design, the arm is adjustable, and the surface is made of non-slip and comfortable rubber. The unique features it comes with is what you would love about this product, especially the multiple loops of different sizes and the tool holder. While we just walked you through the 9 best dog grooming tables on the market – and also explained their important features well – you may still be confused about what features you should exactly look for when deciding on one. This is especially true if your budget doesn’t allow you to simply go for our best pick, or you have some specific needs for which you need a bit more detailed advice. So let us also tell you the most important features to look for when deciding on a dog grooming table. This might sound obvious but not all tables come with a non-slip surface, and even the ones that do, can differ in the quality and safety of their surface. Ideally, you would something that’s both non-slip and comfortable, especially if you have a small dog that’s particularly resistant to grooming. Another good feature to have here would be a static-free surface. It means that the surface wouldn’t stick on to your dog’s hair and other debris, which can be a struggle to remove. A static-free surface almost always ensures that cleaning the table would be a breeze. The rubber ones usually tick most boxes here, but that doesn’t mean you should rule the other materials out. Apart from this, some grooming tables are also waterproof, meaning that they even don’t let the water stay around after you’re done grooming your dog. It wouldn’t be a big deal if the table isn’t perfectly waterproof, but it can be a good additional feature to have, especially if you want the cleaning to be as easy as possible. All the products we picked above come with a completely non-slip and fairly comfortable surface for your dog. This is a big one that’s surprising because it doesn’t get the attention that it should. Even if the surface is non-slip, you would run a risk of your dog falling off the table if it’s too short for them. This usually isn’t much of a problem for people with small to medium dogs, but if you have a very large dog, you sure need to be very careful about the size of the table you get. This is why we particularly included a really large grooming table, which would be a perfect choice for people with very large dogs. However, don’t forget that the large size of the table needs to have enough support as well, or you would again be looking at safety issues for your dog. An important feature to look for here is the strength of the legs of the table, and how thick or sturdy they are. Needless to say, you wouldn’t want to settle for any material here except strong metal. And the legs should also be well-complemented by footpads made of a high-quality, non-slip rubber. These features might seem small but they all combine to offer a safe, stable environment when grooming your dog. The stability is really important too in order to prevent any accidents when grooming your dog, as well as not making them feel frightened. The adjustability is a huge feature, especially when you’re not going for an electric or hydraulic table. It ensures that the table turns out to be a great fit for your dog, and holds them securely in place while you’re grooming your furry friend. The adjustability primarily depends on the arm attached to the table. These arms do come in different types and sizes, and these are important details to consider too. The size of the adjustable arm matters because it determines how much flexibility you will have when grooming your dog. You would want it to be able to keep your dog in a standing position without giving any room to them for sitting down, but while still making them feel comfortable and easy. Similarly, depending on the height of your dog, the adjustability range may need to be fairly large, so that it not only suits the height of your dog, but also helps you have a good length for grooming different areas of your dog’s body. All the products we reviewed above come with a pretty large adjustability range, especially for the size of dogs they are designed for. The sturdiness of the arm of the table is just as important, as a weak arm can come off with a fair bit of resistance from a strong dog, which could obviously be dangerous. The loop attached to the arm must be of good quality as well, and of course, if you have more than one dog or are a professional groomer, you would want to pick the dog table above that comes with more than one loops. Finally, the portability is important too as you will likely find yourself grooming your dog in different places. A portable table would also allow you to groom your dog outside your house if need be, and it can be incredibly useful for a professional. The portability depends on how small the table turns when folded, and whether it can be folded at all or not. The weight is another factor here, but not a big one unless you plan to regularly travel with it. After going through everything we have explained in this post, we hope you must have been able to decide on a product from our list that fits your needs perfectly. However, as a final word, let us reiterate the fact that unless you have more than one dog or are on a very tight budget, you likely may not find anything better than our top pick, the Flying Pig Grooming Table. It’s pretty much perfect in every department with the best non-slip rubber surface, while also offers the added advantage of extra flexibility, sturdiness and is super lightweight and portable.